Howard Stern and SiriusXM have announced The Howard Stern Tribute to David Bowie, a special honoring the legendary musician. The radio event will premiere on Friday, February 9, exclusively on Stern's SiriusXM channel Howard 101. "When I got into rock & roll music, one of the artists that I first really got into was David Bowie," said Stern. "He was always evolving, he was always on top of things, he was just a great musician and a great songwriter and a great singer. I want to make sure that people remember David Bowie." 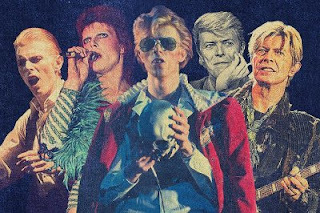 The tribute broadcast will be hosted by Bowie's long-time producer Tony Visconti. "David Bowie's lasting influence on music, past, present, and future is absolutely phenomenal. He will be played a hundred years from now," Visconti said. "I'm glad we can share these fantastic interpretations of his songs. The people who rose to the occasion for the Howard Stern tribute did an amazing job." Peter Frampton - "Rebel Rebel (Live)"
Greta Van Fleet - "The Jean Genie"
Umphrey’s Mcgee (Ft. Huey Lewis And Jeff Coffin) - "Let’s Dance"
Kristeen Young (Co-Produced by Tony Visconti) - "Moonage Daydream"
Britt Daniel - "Never Let Me Down"
Durand Jones & The Indications - "Young Americans"
Michael Penn - "After All"
The Struts - "Suffragette City"
Lisa Loeb - "All the Young Dudes"
Sun Kil Moon (Ft. Petra Haden) - "John, I’m Only Dancing"
Biffy Clyro - "Modern Love"
Bones - "I’m Afraid of Americans"
Todd Rundgren - "Life on Mars?" Dawes - "Oh! You Pretty Things"
Nikki Lane - "Golden Years"
Car Seat Headrest - "Ashes to Ashes"
Low Cut Connie - "Diamond Dogs"
Gogol Bordello - "Rock ‘N’ Roll Suicide"
Billy Corgan - "Space Oddity"